I periodically explain the principles of the Laffer Curve, particularly in hopes that I will educate lawmakers that higher tax rates are a bad idea – even if they wind up generating additional revenue. Obama’s proposed class-warfare tax hikes, for instance, might pull in some extra loot for the political class to redistribute. But is it a good idea to give the politicians more money if the economy loses $5 of private output for every $1 of added tax revenue? This is why it is never a good idea to even think about setting tax rates near the revenue-maximizing level. Sadly, many leftists don’t recognize this tradeoff. They act as if the private sector is some never-ending pinata that is forever capable of disgorging more money if subjected to enough beatings. But parts of the federal government are waking up to reality. Here’s some of what the Government Accountability Office discovered when investigating the impact of some tobacco tax hikes implemented a few years ago. Monthly sales of pipe tobacco increased from approximately 240,000 pounds in January 2009 to over 3 million pounds in September 2011, while roll-your-own tobacco dropped from about 2 million pounds to 315,000 pounds. For the same months, large cigar sales increased from 411 million to over 1 billion cigars, while small cigars dropped from about 430 million to 60 million cigars. According to government, industry, and nongovernmental organization representatives, many roll-your-own tobacco and small cigar manufacturers shifted to the lower-taxed products after CHIPRA to avoid paying higher taxes. …GAO estimates that federal revenue losses due to market shifts from roll-your-own to pipe tobacco and from small to large cigars range from about $615 million to $1.1 billion for the same period. Since the government supposedly was going to get an extra $6 billion-plus from the legislation, this is not one of those rare examples of a tax increase leading to less revenue. But the government is losing 10 percent-20 percent of the extra loot that politicians initially expected. 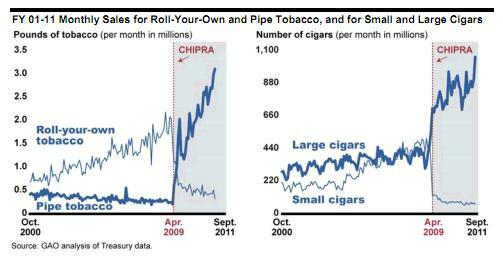 This chart, from the GAO study, shows the dramatic impact of the tax hike on specific segments of the tobacco market. To summarize, big tax hikes on cigarettes, roll-your-own tobacco, and small cigars turned out to be good news for sellers of pipe tobacco and large cigars. …it should consider modifying tobacco tax rates to eliminate significant tax differentials between similar products. Specifically, Congress should consider equalizing tax rates on roll-your-own and pipe tobacco and, in consultation with Treasury, also consider options for reducing tax avoidance due to tax differentials between small and large cigars. Needless to say, if lawmakers decide to “eliminate significant tax differentials” and “equaliz[e] tax rates,” you can safely bet that they’ll decide that some tax rates should go up. What about solving the alleged problem by lowering the tax rates that are high? Those of you who have followed my writings on international tax policy already know the answer to that question.